Bold. Dramatic. Elegant. Modern. If these are concepts you’d like to incorporate when designing or building a luxury home, we have four more words for you: Pietra Gris Montana Tiles. Whether used as an accent marble, a countertop, or flooring, this superior stone will set your interior decor apart from traditional residential design. The aesthetics of this luxury marble tile lend a hint of mystery, allure, and stately elegance to any setting. Think executive boardrooms and luxe master baths. Black marble is most commonly quarried in Turkey, predominately in the Anatolian region, where the geological makeup of the soil gives dark marble its distinctive characteristics. The dark gray color and black background make Pietra Gris a more subtle choice than stark black and white marbles, the surprising occurrence of striking red veining adds a dramatic flair. Black and gray marble offer other benefits over traditional whites and tans while adding a nice contrast when pairing with other stones. Marble is naturally impervious to extreme temperatures, making it a clear winner when deciding among materials for outdoor decoration. Dark marble hides any blemishes or defects well and retains its finish longer than its lighter counterparts. It’s also easier to keep clean. Pietra Gris Montana is more resistant to stains and surface wear when properly maintained than light-colored marble. Simply wipe with a soft cloth dampened with distilled water and allow to air dry. Tap water may contain chlorine and minerals that affect the color and surface finish; you should also avoid using abrasive cleansers. Where white marble tiles create a sense of light and space, dark marble is more intimate. This makes Pietra Gris ideal for large bathrooms or kitchens as wall or flooring tile. When used on opposing walls in a longer space, it draws the eye toward the center of the room, creating a focal point when you want to highlight a piece of art or furniture grouping. This material is also very striking if you want to tile a single facing wall when entering a living room. Dark marble tiles offers a contemporary component in modern design and decor. Black, white, and silver is a rather futuristic color combination. In the kitchen, install Pietra Gris tiles as a countertop material or backsplash to make white cabinets and stainless steel appliances pop. If you want to impart a sense of space, use Pietra Gris marble tiles judiciously. They can make a white tub seem to float in space when used as a platform or backdrop, bringing additional serenity to your soaking time. Pietra Gris marble is also ideal as a mantle piece or as an accent tile. The darker hue gives a highly polished specimen a mirror-like reflection that has many applications in interior decor. Looking to Use Pietra Gris Montana Marble Differently? Are you looking for a bold statement? Tile one wall or an entire floor with Pietra Gris Montana tiles as a backdrop for white furnishings. This particular tile is also perfect for monochromatic color schemes with a modern flair. Imagine it in a room with furnishings upholstered in shades of grey, with an occasional pop of dusty rose accents here and there for cheer. If your lot of Pietra Gris Montana marble contains a number of samples with the beautiful red veining, you’ll have another style option to add a hint of warmth. As an accent in a room with a cushy red chair or chaise, the effect is exquisite. In order to keep your darker marble construction from becoming too dominant and overwhelming, try pairing with other marble, stone, or ceramic tiles. As with photography, decorating with black and white can become mysterious, bold, or sensual. You can create any number of intense combinations using Pietra Gris Montana marble tiles with stark white porcelain. Want a twist on vintage checkerboard flooring? Consider using Pietra Gris Montana and white marble. If you’re looking for the perfect marble to use with Pietra Gris Montana tiles, consider Crema Marfil. 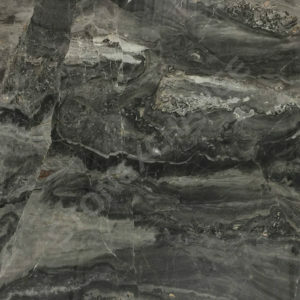 It has a similar veining pattern and a warm tone that brings out the reds in the Pietra Gris Montana marble. This combination would look great as wall and border tiles for a shower enclosure, around a fireplace, or as a hearth. Due to its durability and weather resistance, marble is often used for outdoor structures, patios, and statuary. For ultimate luxury and elegance, a dark marble lap or infinity pool would look amazing. Pietra Gris Montana marble is often used in the reception areas of upscale hospitality centers, so imagine placing as steps or a threshold leading to an elegantly tiled residential foyer. The work stations of an outdoor kitchen would also benefit from a Pietra Gris Montana countertop. As a premier importer and wholesaler of fine marble and other natural stone tiles in Southern Florida, Nalboor Tiles allows you to deal direct with the source. That doesn’t merely save you time and money. We also handle all of the logistics of overseas shipping, sparing you the hassle and expense. Our pricing, quality, and selection make us a natural choice for builders, designers, and supply houses in the local community and across the country. For more than a decade, Nalboor Tiles has worked to maintain a reputation for excellence in both quality and service. But, you don’t have to take our word for it. Our merchandise speaks for itself. Request your free sample of Pietra Gris Montana Marble or place your order through our convenient online portal. In order to better serve our valued customers, we make connecting with us easy. Just click here to send us a message or talk to a live representative at 305-501-4548. We look forward to offering you our full assistance.